As anyone who’s ever watched a Wes Anderson film will tell you, a mere description of the plot in no way prepares you for the sheer ingenuity and the delightful quirkiness of his work. His latest, Moonrise Kingdom, has many familiar elements from his earlier films – oddball characters, storybook visuals, an offbeat sense of humor, and yes, Bill Murray. Beautifully written, with much deadpan humor and a lot of sincere affection, the film benefits from some deliciously odd exchanges between its characters. Witty and whimsical in equal measure, it has the feel of a quirky fairytale, and bears Anderson’s stamp all over it…from the cartoonish ‘action’ scenes to the over-stylized production design.I’m going with four out of five for Wes Anderson’s Moonrise Kingdom. There’s sadness, emotional depth, and real feeling here. It’s a melancholic comedy that you absolutely shouldn’t miss! Wes Anderson’s latest cinematic pastry is a work of obsessive detailing and characteristically artful icing, all colours and dreamy sequences and frames good enough to eat. Yet Moonrise Kingdom — which manages the stunning feat of being both entirely unreal as well as entirely relatable, both the stuff of children as well as the yearning of ex-children — is one of the director’s most emotionally fulfilling films, a curio-box cranked to play a tune good enough to moisten the eye. There is a spectacular amount of icing, to be sure, but the film merits every bit of this garnish.For it is also, remarkably enough, a fully-realised and quite overwhelming love story: a romance for the ages that also just happens to be an underage romance. The year is 1965. The place is the island of New Penzance where paved roads do not exist. And the lovers in question are two adolescents, still immature, still growing up. And that is what makes Anderson’s Moonrise Kingdom different. The two bring out the stupidity of teen life … and the over carefulness of adulthood with ease. In fact, the two make adolescence, growing up and first love seem like cakewalk.Just make sure you follow Wes Anderson pretty well to get the idea bang on. All Anderson’s elements such as subtle humour, heightened realism, thethemes of precocious, children antagonised by parents, are present. Stellar performances from all makes Moonrise Kingdom a delightfulwatch. Gilman and Hayward are both excellent as they play their respective characters with their emotions nicely underplayed anddespite their dead-pan expressions they are an adorable pair. Moonrise Kingdom sweeps you off your feet; its innocence draws you in and leaves you with a big smile. This one is destined to go down as one of Anderson’s best. Moonrise Kingdom is the best Wes Anderson can get—profound, funny and supercilious, all at the same time. Will they find their kingdom? Anderson’s answer is philosophical but entrenched in reality, although the film has many episodes that make it look like panels from a fantastical fairy-tale comic book. Through the wilderness, the domestic funk and precocious childhood, Moonrise Kingdom has a humour that keeps it amazingly light. 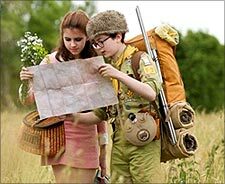 Anderson may not be a director you can instantly warm up to, but for anyone familiar with his work, Moonrise Kingdom is an absolute treat..